Welcome, vistors! You have landed on a temporary web site* with photos from my summer vacation. My sister Martha Clark and I attended the 2002 annual meeting of the Lewis and Clark Trail Heritage Foundation held in Louisville, Kentucky. We had a wonderful time learning about the history of the Lewis & Clark Expedition and made many new friends. This year's meeting focused on some Clark family sites in and around Louisville. We had been to some of these places before, but many of the sites were new to us. After the meeting ended, we traveled further south to visit cousins in Green and Metcalfe Counties in Kentucky, and I have included photos from that part of our adventure, too. The meeting was held in Louisville, on the banks of the mighty Ohio River. To the left is a picture of the view from our hotel window at the Galt House Hotel. Approximately 450 persons from the U.S., Canada and England attended the meeting, and we were transported to sites around Louisville on air-conditioned buses. 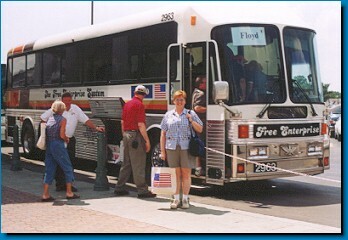 Each bus was designated with the name a Kentucky member of the Expedition. On the first day, we rode on the bus named for Sgt. Charles Floyd, the only member of the Expedition who lost his life on the trail when he died of appendicitis near what is now Sioux City. One of the tours included an elegant lunch at Churchill Downs, home of the Kentucky Derby. The grandson of William Clark -- Col. Meriwether Lewis Clark, Jr. -- founded the Louisville Jockey Club and was the man who initiated the annual horserace. His mother was Abby Churchill Clark, and the racetrack was located on land leased from his uncles, John and Henry Churchill. We cruised down the Ohio River on the paddlewheel steamer, The Belle of Louisville, one of the few remaining steam paddlewheelers in operation today. We were entertained by musicians from the Tin Penny Bit as we rolled down the river. Molly shares conversation with General William Clark (reenacted by Craig "Rocky" Rockwell of Clarkston, WA) and Fred Courtney. T he U.S. Army Corps of Engineers sponsored the appearance of the Frontier Army Living History Association reenactors from the Frontier Army Museum at Fort Leavenworth, KY. They greatly added to the fun of the meeting with their knowledge of the Expedition and their authentic costumes. Here, Jim Krause, a Corps-sponsored reenactor of Pierre Cruzatte (with the fiddle) talks with one of the meeting participants (left) and another Cruzatte reenactor, Daniel Slosberg.